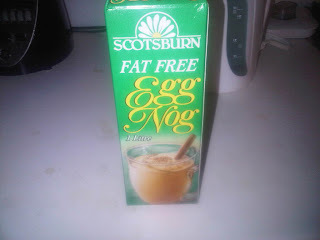 One of my favourite things about the holidays is the return of Eggnog! Unfortunately this delicious drink is very high in calories, with even the fat-free versions being high in sugar. The good news (for me :D) is that I just finished a fight and have some time to relax and enjoy some cheats! With MMA, unlike many other sports, we don't exactly get an "off season," so long periods of off time don't really happen, but I do get to enjoy a bit of time of high calories, so I figured I'd try to combine a nutritious, fat-burning/muscle building meal with my favourite holiday flavour. Chop banana into small pieces and combine all ingredients except blueberries in a blender. Blend on high for 30 seconds or until mixture is consistent.